Mindanao workers camping out in Mendiola expressed their opposition to President Rodrigo Duterte’s pronouncement that he will extend Martial Law in Mindanao until December 31, 2017. “Tutol na tutol kami sa extension ng Martial Law dahil kaming mga manggagawa ang biktima ng Martial Law sa SMR [Southern Mindanao Region] (We are strongly opposed to the extension of Martial Law because us workers are the victims of Martial Law in SMR),” said Royjim Balanghig, President of Shin Sun Workers Union. On July 18, Malacañang announced that Duterte has called on the Congress to extend Martial Law until the end of the year. Presidential Spokesperson Ernesto Abella said that Duterte has decided to ask Congress to extend Martial Law since he believes that the siege in Marawi City will not end until July 22, the end of the Martial Law proclamation. “For this reason, that because public safety requires it, I call upon the Congress to extend until 31st of December 2017, or for such a period of time as the Congress may determine, the proclamation of martial law and the suspension of the privilege of the writ of habeas corpus in the whole of Mindanao,” said Duterte’s statement delivered by Abella. On the other hand, Kilusang Mayo Uno SMR Secretary-General Carlo Olala believes that the violence against workers and people of Mindanao will only worsen if Martial Law will be extended. “Nakikita natin na marami pang posibleng biktima na mga sibilyan kasi sa loob ng dalawang buwan, marami nang karahasan ang ginawa ang AFP at PNP, katulad ng mga manggagawa sa Shin Sun. Yung dagdagan pa ng limang buwan, nakakabahala yun (We see that more civilians can become victims because in a span of two months, the AFP and PNP has used violence, for example with the workers of Shin Sun. The additional five months is alarming),” said Olala in an interview. According to Balanghig, since Martial Law was declared in Mindanao on May 23, Philippine National Police (PNP) and military troops were immediately deployed inside Korean-owned Shin Sun Tropical Fruits Corporation in Compostela, Compostela Valley. At that time, Shin Sun Workers Union was already three months in their picket line outside the plantation when they declared a strike after 81 union members were dismissed by Shin Sun’s management. 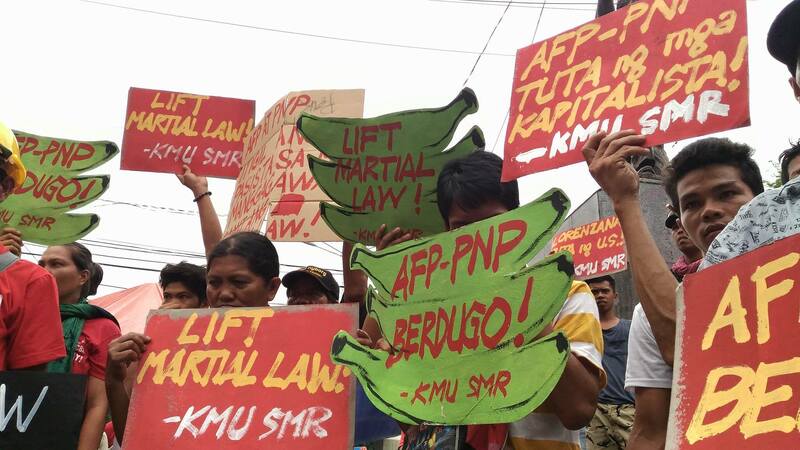 On June 2, Shin Sun Workers Union’s picketline was violently dispersed by elements of Compostela’s PNP and Philippine Army’s 66th Infantry Battalion. Fifteen (15) were injured including a worker’s 15-year old daughter during the dispersal, while three were charged with direct assault. According to Balanghig, the PNP and military used Martial Law to justify the violent action. “Walang magandang idudulot ang kanyang Martial Law at extension pa nito (No good will come from Duterte’s extension of Martial Law),” said Balanghig. Balanghig added that more human rights violations will be perpetrated under Martial Law. The labor leader vowed to hold more protests to oppose the planned extension of Martial Law. “Mas lalo naming papaigtingin ang mga kilos protesta [laban sa Martial Law] para hindi na maulit ang naranasan ng mamamayan noong rehimeng Marcos…hindi kami titigil hangga’t hindi siya [Pangulong Duterte] magbibitiw ng salita na i-lift na niya ang Martial Law (We will further intensify our protest actions against Martial Law so that the people will not experience again what happened during the Marcos regime…we will not stop until President Duterte will say that he will lift Martial Law),” concluded Balanghig.